Experts say that a small hole known as a coronal hole has opened in Sun's atmosphere which will send a stream of solar particles into space. A team of scientists has predicted that a dangerous solar storm could hit Earth on November 18, which may cause serious consequences like satellite and internet blackout. Experts say that a small hole known as a coronal hole has opened in Sun's atmosphere which will send a stream of solar particles into space. A report published on the website 'Space Weather' has predicted that the stream of solar particles is now heading towards the direction of Earth, and once it hits the planet, dire consequences will be triggered. "As Earth exits one stream of solar wind, another stream is on the way. Estimated time of arrival: November 18. 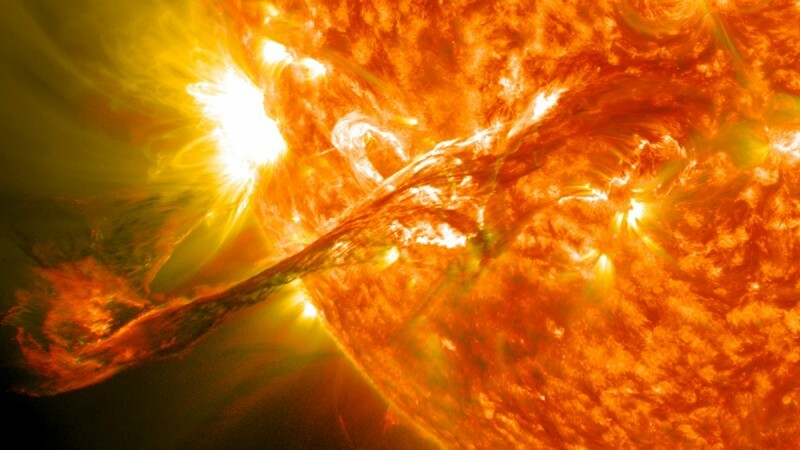 The gaseous material is flowing from a relatively small hole in the sun's atmosphere. Polar geomagnetic activity and Arctic auroras are possible this weekend," researchers revealed, Express.co.uk reports. Unlike the usual solar storms that usually cause southern or northern lights, this upcoming stream of solar particles may affect humanity very badly. Even though the earth's magnetic field will protect humans from the harmful sun's radiation, these storms could actually affect satellite-based technology like the internet. It should be also noted that these solar storms could lead to high currents in the magnetosphere, finally resulting in higher than normal power in electricity lines and power grids. Experts believe that increased power supply in electrical lines could make transformers and power stations blow up. If the solar storms break Earth's magnetic field and reach the surface of Earth, it will cause dreaded diseases like cancer among living beings. The most powerful geomagnetic solar storm to hit Earth was way back in 1859. As an aftermath, telegraph operations all over North America and Europe failed, and in some rare cases, telegraph operators got electric shocks. Another solar storm with similar magnitude happened in 2012, but it passed Earth's orbit without hitting the planet. In the meantime, a section of conspiracy theorists has started claiming that the increase in disastrous natural events like solar storms could be the indication of an imminent apocalypse. These conspiracy theorists outlandishly argue that these solar events are actually fulfilling biblical prophecies.